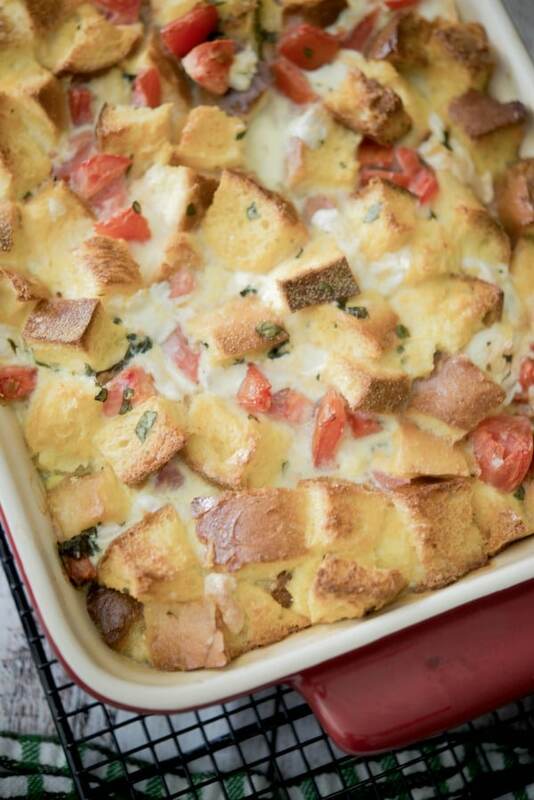 Caprese Breakfast Strata made with Italian Semolina bread, ripe plum tomatoes, fresh mozzarella, basil and eggs; then baked until golden brown is a tasty way to feed a crowd. 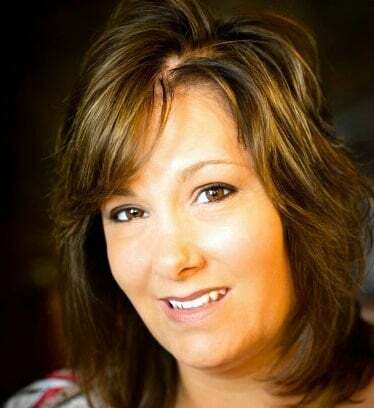 Mother’s Day is coming up and since most people tend to associate the day with breakfast or brunch food, I wanted to share a new recipe that was easy to make, can be prepared ahead of time and can feed a crowd. 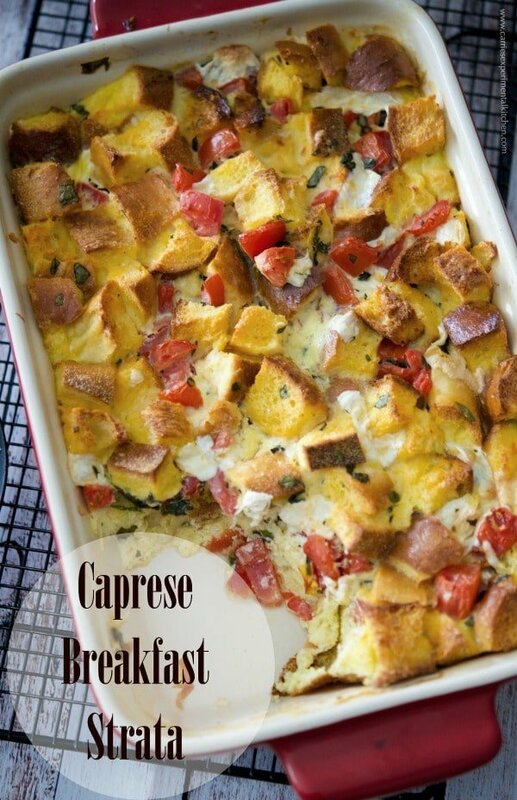 This Caprese Breakfast Strata fit all three of my requirements perfectly! My family loves anything made “Caprese” style; which consists of three ingredients: tomatoes, fresh mozzarella and basil. It’s one of my go-to flavors for so many of my recipes because it never disappoints. 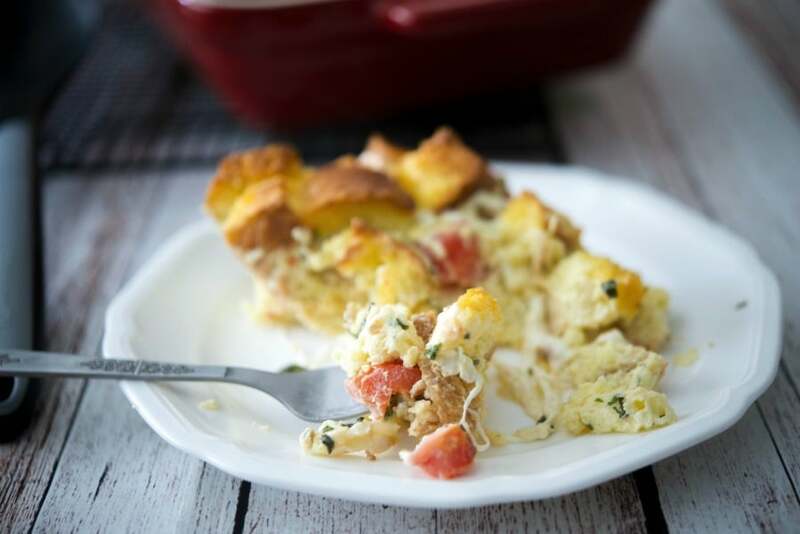 I generally don’t make a lot of breakfast recipes because I’m a creature of habit and tend to eat the same few things every morning, but when I made my first strata a few years ago I was hooked. The problem is that I generally don’t host a crowd for breakfast so I don’t make them very often, so when I decided to make something new, of course I went to my favorite flavors. For this recipe you’ll need a loaf of day old Italian Semolina bread, Roma tomatoes, fresh basil, fresh mozzarella, eggs and milk. First, cut the bread into bite sized cubes; approximately 1″-2″ and place in a mixing bowl. Add diced tomatoes, basil and cheese; then toss together. Add the bread mixture to an oven safe baking dish (mine was 9″x13″). Next, combine eggs with milk; then pour over the top of the bread and bake for 40-45 minutes until the eggs are no longer runny and the casserole has “puffed” up. 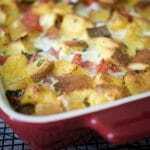 What I like about these breakfast strata’s is that you can also prepare them the night before; then reheat when you’re ready to serve. 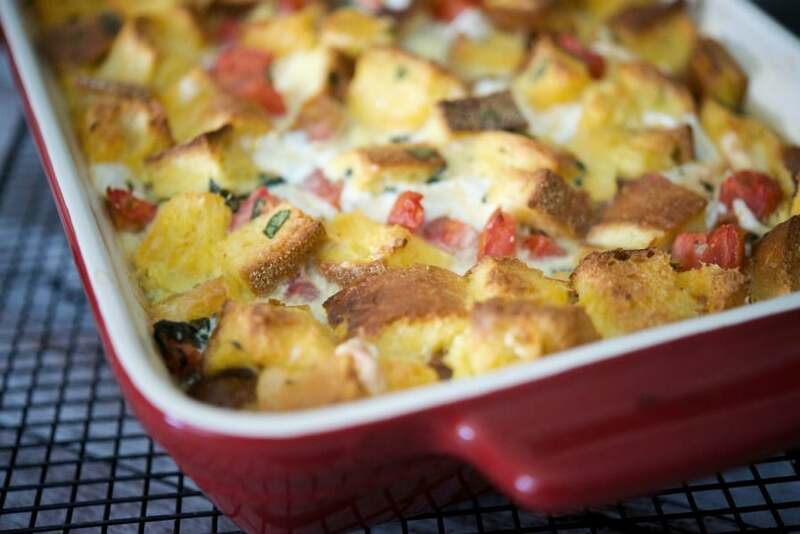 This Caprese Breakfast Strata feeds 8-10 people. We’re a family of four so we weren’t going to eat all of this ourselves, so I brought some to my Bunco group to try the next day and it reheated beautifully. ~Enjoy! Combine the bread, tomatoes, basil and mozzarella in a large bowl and toss together; then place in an oven safe baking dish (9"x13"). Whisk the eggs and milk together in the same bowl used for the bread; then pour over the bread mixture. Bake for 40-45 minutes until the eggs are no longer runny and the casserole has "puffed" up. *You can also prepare this recipe the night before and keep refrigerated; then reheat when you're ready to serve.